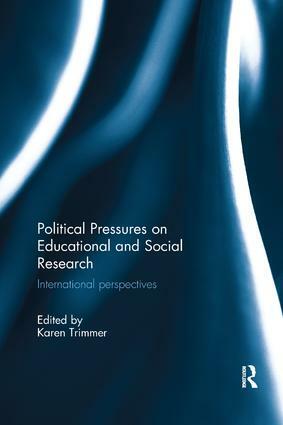 Section 1 Contexts surrounding policy, ethics, power and resource 1 The pressures of the political on rigorous and ethical research Karen Trimmer. 2 The problem of the policy agora: how power differentials, methodological naivety and the ideological preferences of policy-makers affect the development of government policy Chris Brown. 3 "What works? ": From health to education, the shaping of the European policy of evidence Romuald Normand. 4 Ethical drift in educational research: understanding the politics of knowledge production Patrick M. Jenlink and Karen Embry Jenlink. 5 Play the game or get played? Researchers’ strategies around R&D policies Sofia Viseu. 6 On Relevance and Norms of Science in times of Restructuring: Educational Research in Sweden Rita Foss Lindblad and Sverker Lindblad. 7 Is the Emperor naked? Experiencing the ‘PISA hysteria’, branding and education export in Finnish academia Fred Derwin. 8 Making an impact: politics and persuasions in 21st century Higher Education Joanne Doyle and Lisa McDonald. 9 The impact of managerial performance frameworks on research activities among Australian early career researchers Eva Bendix Petersen. Section 2: Case studies from the field 10 Ethical dilemmas in program evaluation Carina Calzoni. 11 Surfacing the implicit Kevin Gaitskell. 12 Balancing relationships and intellectual rigour in research for Government Agencies Graeme Gower and Gary Partington. 13 When research, policy and practice disconnect: An educational leadership policy example Vicki Farwell. 14 The Politics and Complexity of Research Utilisation in the Central Education Policy Arena in Taiwan Hung-Chang Chen. 15 The pressures within: dilemmas in the conduct of evaluation from within government Karen Trimmer. Karen Trimmer is Associate Professor with the University of Southern Queensland. With extensive experience in education, her research interests include decision-making by school principals; policy and governance; social justice impacts of policy; Indigenous participation in higher education and quantitative methods.